Alright guys, one more day 'til we land in Denver. We'll be updating on through photos on Flickr, occasionally through audio on Utterz, and through video on YouTube... You'll be able to find everything here though, so make sure to check back. From the looks of things it's pretty crazy over there. 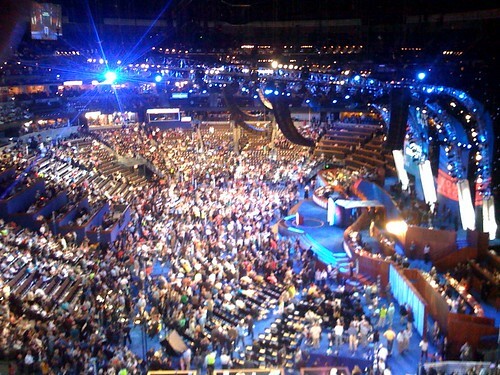 Watch the 2008 Conventions on YouTube. Videos from delegates in Denver and St. Paul and behind the scenes footage from the convention stage. There's also a YouTube page exclusively focused on The Big Tent. And of course, a page exclusively for the DNC and the RNC. During an election cycle a lot of us can be bull-headed and close-minded. Sometimes we are bred into a certain party and don't bother questioning why we believe the things we do. Why not take the Politics Test to see where you really fall in the political spectrum. You may be surprised at the results. If you're not satisfied with any of the candidates, why not run for Prez and create your own campaign with Campaign Creator. Yeah, I received this from Josh Finn and got all excited, even if it was a template... A cool little video to send to a friend. You'll make their day.